This is a free equivalent of our simple cleaning T&Cs template. 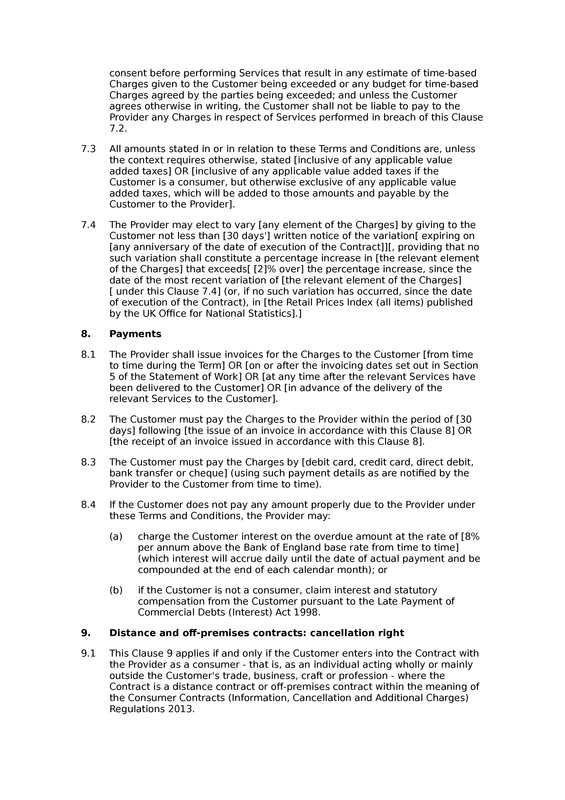 The only difference between the two documents is that this one includes a textual credit/attribution; purchase the simple document if you would like to use the document without the credit/attribution. 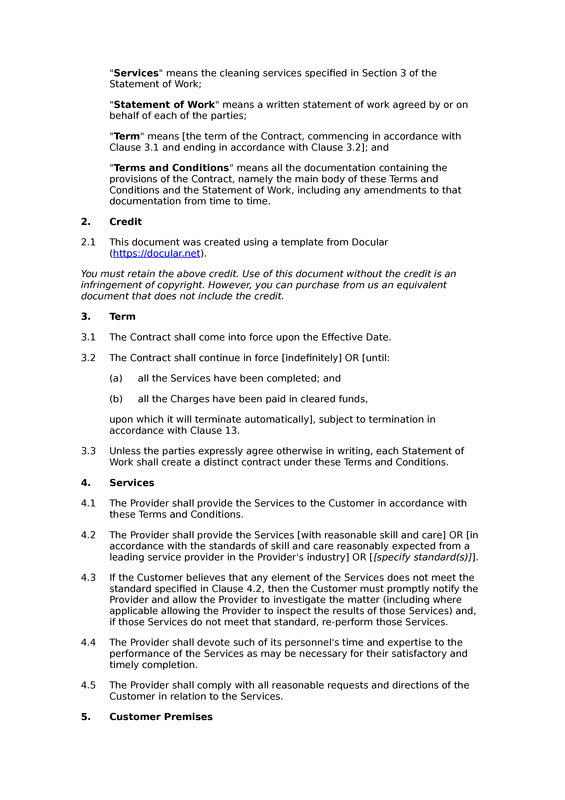 Although simple, the T&Cs are relatively flexible, and can be used to cover ongoing cleaning services jobs, as well as one-off jobs or jobs involving a pre-defined set of engagements. 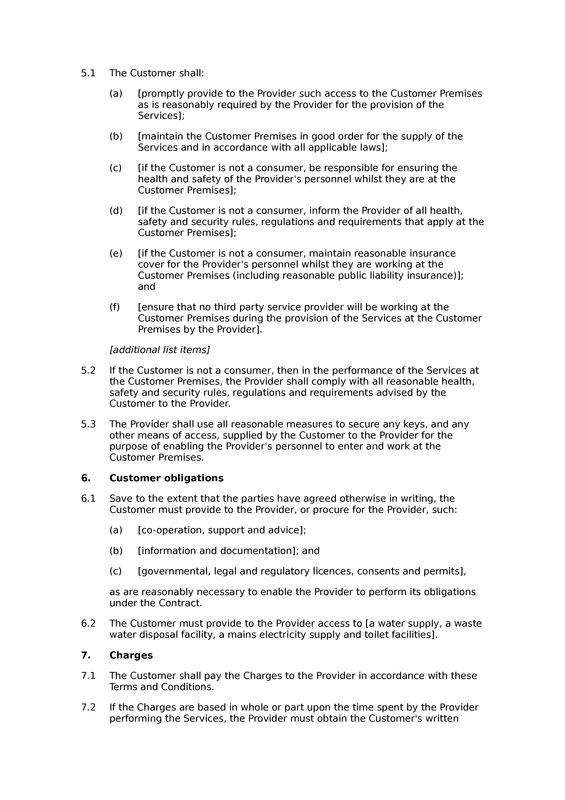 The commercials should be set out in a statement of work, a skeleton version of which is supplied with this document. 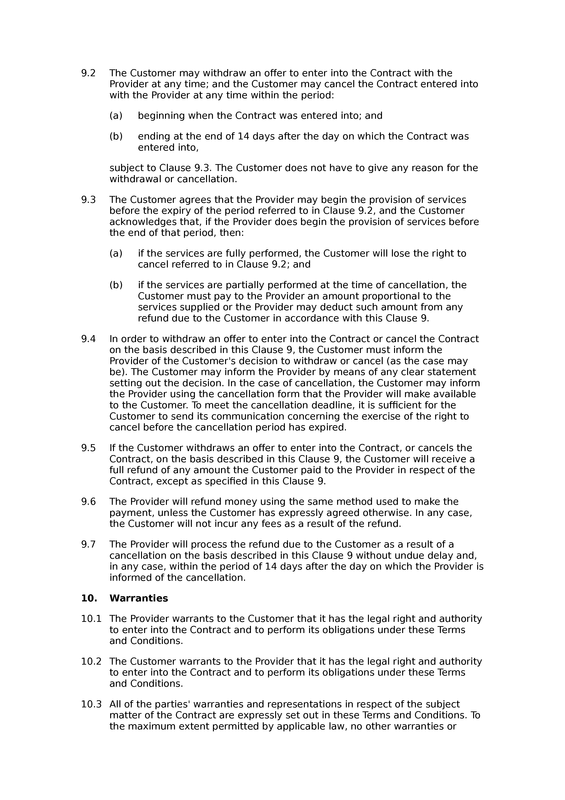 The T&Cs are may be used in respect of B2B and/or B2C contracts. 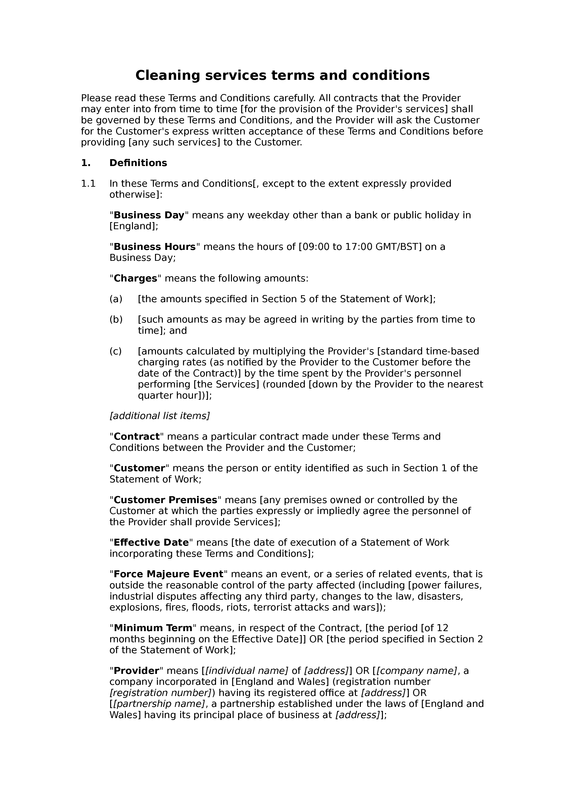 Term: commencement of term; end of term: indefinite, or services completed and payment made; each contract distinct. Services: obligation to provide services; standard of services (B2C or mixed); failure to meet services standard; devotion of personnel to services; services: compliance with reasonable customer requests. 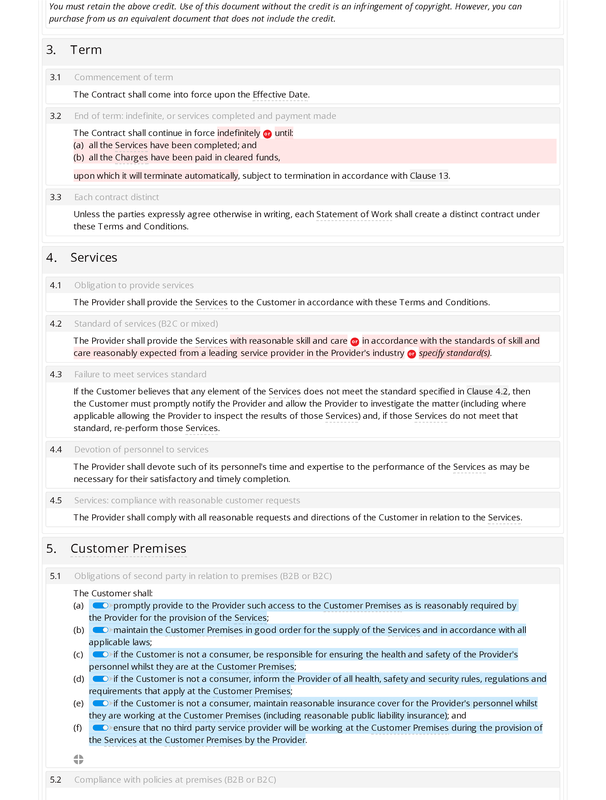 Premises: obligations of second party in relation to premises (B2B or B2C); compliance with policies at premises (B2B or B2C); securing means of access to premises. obligations: general second party obligations; provision of access to utilities. Charges: obligation to pay charges; time-base charges limitations; amounts inclusive or exclusive of VAT (B2B or B2C); variation of charges. 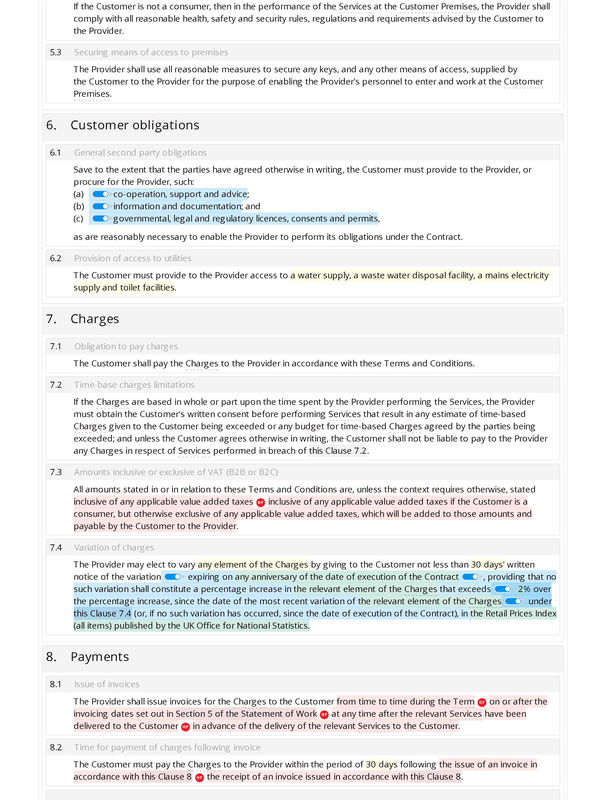 Payments: issue of invoices; time for payment of charges following invoice; payment methods; interest on late payments (B2B or B2C). 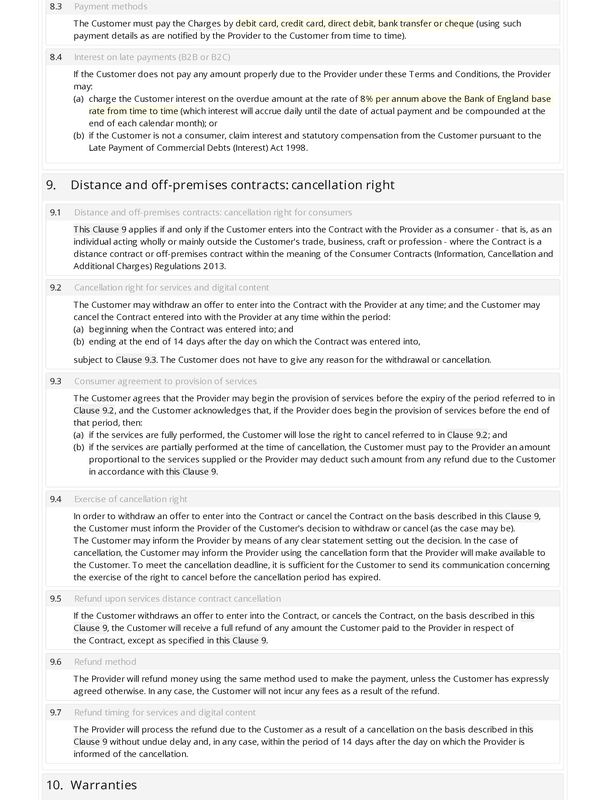 Distance and off-premises contracts: cancellation right: distance and off-premises contracts: cancellation right for consumers; cancellation right for services and digital content; consumer agreement to provision of services; exercise of cancellation right; refund upon services distance contract cancellation; refund method; refund timing for services and digital content. 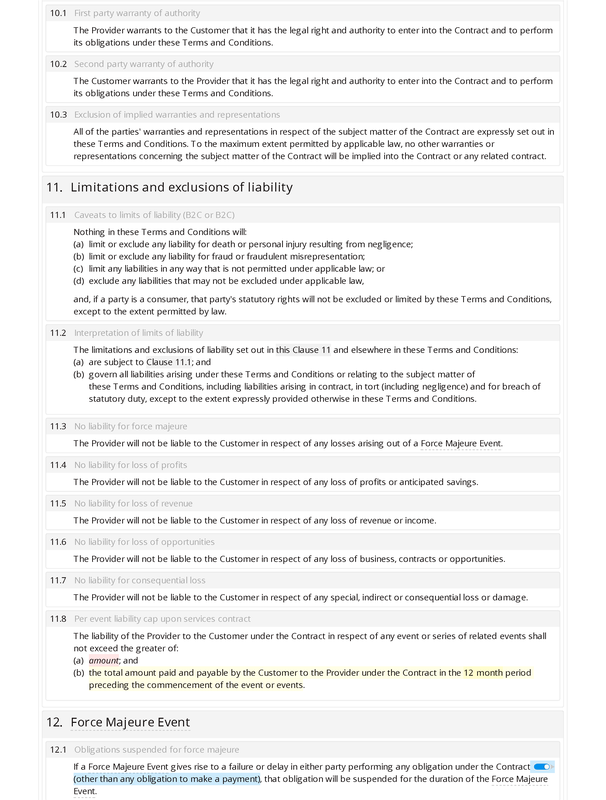 Limitations and exclusions of liability: caveats to limits of liability (B2C or B2C); interpretation of limits of liability; no liability for force majeure; no liability for loss of profits; no liability for loss of revenue; no liability for loss of opportunities; no liability for consequential loss; per event liability cap upon services contract. 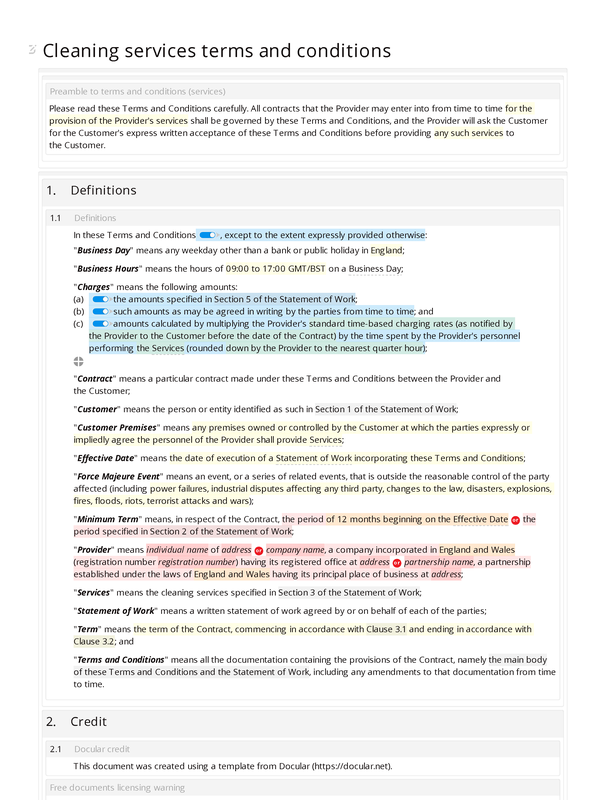 Termination: termination without cause (optionally assymetric); termination by either party without cause; termination upon breach; termination upon insolvency; termination upon non-payment. : first party is independent contractor not employee; no redundancy or compensation. Notices: contractual notices must be in writing; methods and deemed receipt of contractual notices; substitute contact details for notices. General: no waiver; severability; variation written and signed; asymmetric assignment of contractual rights (B2B, B2C or mixed); no third party rights; entire agreement: documents; governing law; exclusive jurisdiction.